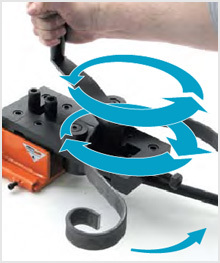 The new Micro Bender development when supplied with our Master Riveting, Bending & Rolling turns the tool into the ultimate wrought iron bender and metal shaping tool. Packing all the features of the basic Master Riveting, Bending & Rolling (RBR) tool (see MC016) , the Micro bender add on comprises 2 dual function drop on dies which can be used with three new bending heads as well as the existing diamond shaped bending head to allow you to make tighter bends, radiused bends and also allow free form progressive bending. Packed with all these features it makes this combo a remarkably powerful and versatile metal forming hand tool. For those existing owners of the MC016 Master RBR tool, the separate micro bender kit can be purchased in our Optional Extras section ref: part number MC1005. These versatile 3 in 1 metal bending tools are the cornerstone of the Metalcraft range. They rivet your metalwork together without welding (see below) and they bend and roll your metalwork into shape. Now with the added Micro Bender to give even tighter bends and allow you to to progressive free style bend. 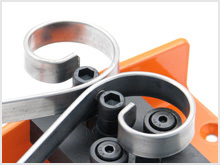 These bending tools are supplied complete with operating instructions and spare parts lists. Rolling is achieved by using the winding handle to drive the bar forwards and backwards through the rollers. As this is done with each pass, the long lever is used to gradually increase pressure to roll an ever tighter curve. End stop screw and nut fitted for producing consistent bends and circles/arcs when rolling.